We care about the well-being of your customers at trade fairs, events, in your company or in promotions. As Germany’s leading mobile massage company neckattack® provides with an unrivaled mobile massage service. It only takes a moment to book your appointment. Then we provide you with a professional and very relaxing massage in the office or at your show! German-wide availability is possible – through the high variation of massager is almost every appointment to 95% possible. We offer chair massage at a short massage on the mobile massage chair (about 10-20 minute massages). Our Wellness masseurs / inside and physiotherapist / interior come to you and bring all the necessary utensils with massage. Far from conventional massages offers neckAttack® the Australian massage. An Australian massage lasts between 5 and 10 minutes, is performed in the shoulder and neck area on clothes. The massaged sitting on the office chair, bar stool or any other seating. A special massage chair is not necessary. Planning a fair and are looking for something special? The mobile massage by neckattack ® pampers your visitors and customers directly at your exhibition booth. The success of an event events stands and falls with the enthusiasm of your guests. Our masseurs and masseuses ensure with their friendly and motivated way that your customers are relaxed and happy! 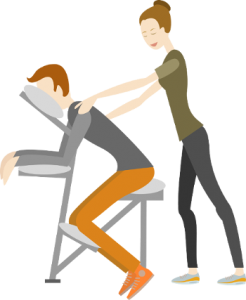 Mobile massage in companies you want to do as an employer to your employees something really good – as already Lufthansa, Bayer, and Accenture and many others ? Book of the mobile masseurs of neckattack ® for corporate massage! Mobile massage for your promotional campaigns we enrich your promotions nationwide with our masseurs and masseuses in any industry and for any occasion. Already Hocked? Give Yourself A Break With neckattack©!